Having spent three years behind a desk in London, the call of the sea once more became too much to ignore, so resigning my job, I left for Spain in early December to help the owner of the good yacht 'Thankful' sail down the west coast of Africa and on to the Caribbean. It has been an quite the adventure, sailing from to Morocco, The Canary Islands, Senegal, The Gambia and Cape Verde, where we are now at anchor off Mindelo on the island of Sao Vicente. The time has almost come to leave this side of the Atlantic and commit ourselves to the trade winds that will carry us swiftly, we hope, to the tranquil beaches and rum dacquiris of Matinique. While I have been sailing this side of the pond and having the time and opportunity to see for myself, a number of things have struck about the state of our oceans. I am not a scientist, oceanographer or anthropologist, so these are in no way scientific statements, but I am a Sea-Changer, so I wanted to report on what I've seen and the themes that have emerged consistently in all of the countries we have visited. The three big issues appear to be these: the amount of rubbish being put into the ocean, the number of fish being taken out, and the poverty that afflicts the people who rely so heavily on the health of the ocean. The oceans are a finite resource. Enormous, yes, but still finite and it appears to me that we are using them up like we use other natural resources. I am going to post a blog about each of these issues. I hope you enjoy them and that they prompt your own thoughts and maybe even actions. In the old days, sailors knew they were approaching land by the change in the colour of the water, the presence of sea birds and clouds on the horizon. As we approached Dakar in Senegal, our first landfall in sub-Saharan Africa, the first sign of land we saw was plastic; plastic bottles and bags drifting out to sea, blown by the strong Harmattan winds that had battered us and covered our boat in fine orange dust from the desert. Closer in, we became aware of the smell of the land, a sweet smokey smell that was in part grilling meat on charcoal fires, but also the smouldering piles of rubbish we found on the streets of the city when we went ashore. 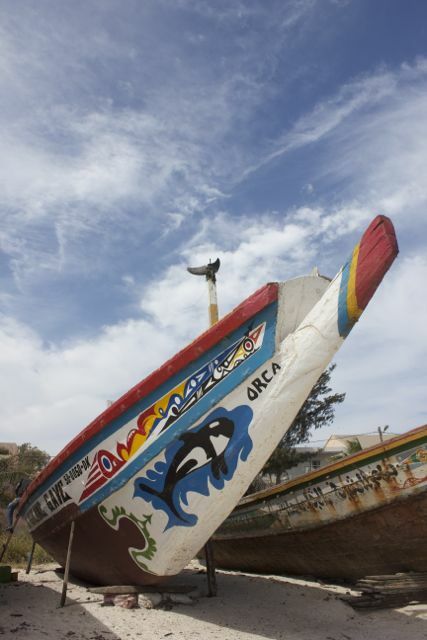 Dakar is a busy, dusty, bustling capital city and the largest port in western Africa. It is vibrant, interesting, friendly and has great music. Everywhere we were greeted with “Bonjour, ca va?” and warm smiles. But it is a poor city. People live next to their tiny fishing boats under a tarpaulin, or beg on the streets, eking a living where there seems to be none. So it hardly surprising that along the potholed and crowded streets, dealing with rubbish is not people's priority. Sometimes there are bins. Mostly it is dumped and piles of rubbish grow at regular intervals, bags split open, left to rot. Goats wander the back streets and graze whatever is edible from them, metal rusts or is taken, but the plastic remains. Rags of plastic bags, bottles, wrappers, and cups from the 50 cent espressos sold on the streets in the morning; it all simply stays there, trampled into the dust and swirled by the strong winds, carried down the streets. Some of inevitably ends up in sewers and on the beaches. 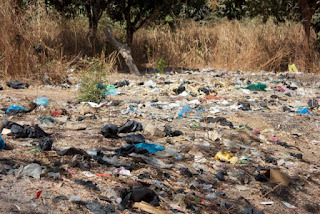 Similarly in The Gambia, though noticeably cleaner, predominantly from a smaller population, rubbish is dealt with in the same way, quietly dumped out of the way (or in the way, as often as not) to be eaten by goats and to be carried away by the wind. We did see efforts at least to collect rubbish in Gambia; a tractor and trailer filled to overflowing with rubbish collected from bins on the street and from houses. But the rubbish dump in Banjul the capital is simply a huge field enclosed by wire fences where the rubbish is tipped and left, not buried or covered or recycled. Similarly in Morocco, the Oueds - the dry river beds - were used as communal tips, rubbish cascading down their sides. When the rains come they come with enough force to carry boulders down from the mountains and so the rubbish goes straight out to sea. Even in the Canaries plastic littered the sea. Snorkelling in the marine reserve of La Graciosa, there were plastic bags in amongst the rocks and reefs. It is so frustrating that there is nowhere that isn't blighted by plastic. At first it appears like laziness both on the part of the individuals who dump it and on the part of the governments who don't provide the infrastructure to deal with it. But as I've spent more time in these countries the problem becomes inevitably more complex than that. Firstly, finding an environmentally friendly way of dealing with their rubbish does not feature as a priority compared to say, earning enough to feed the family and getting by day to day. Life is challenging enough as it is. Having said that, there is laziness when it comes to rubbish – people will just drop litter on street in front of their own houses without giving it a second thought. It seems that litter on the street simply doesn't bother people the way it offends our western sensibilities. Secondly, there is a lack of awareness, as much in the UK as in western Africa, about what happens to our waste and where it goes once we've used it. So much plastic is used that ends up on the street, in the ground or out at sea and yet we continue to use it. Every purchase made in Senegal and Gambia is taken home in a little black bag which is then discarded. This made me think about our use of plastic in the first place. In the villages along the banks of the Gambia river that we visited, people really are poor and western style products with all their associated wrappers and packaging are simply not affordable. I am not condoning their poverty and how difficult life is for them, but in their more traditional way of living, they eat what their local environment can provide and the waste produced is virtually all organic so rubbish, particularly plastic, is far less prevalent. Why do we have to use plastic bags at all? What is wrong with cotton bags, or even baskets? The final thing that has struck me is that in the west, we can hardly buy any products that are not first wrapped in cardboard and plastic, everything is packaged. Even if it is not food, we buy cheap products that don't last and that we throw away rather than mend. People naturally and rightly aspire to better standards of living and to work their way out of poverty. 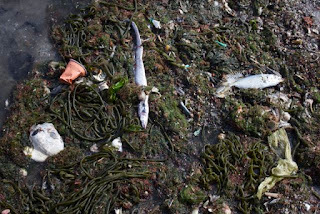 Sadly, this means more plastic bags, more low-quality factory made goods, more disposable goods, more packaging and more dis-connection from the natural world. Plastic seems to be fundamentally linked to the dream of prosperity. We are addicted both to that dream and to the plastic bags that swirl in the wind. I don't know how plastic waste ranks as a global polluter of the oceans; maybe overfishing and chemical pollution are worse. But plastic pollution appears particularly bad in the poorer countries of western Africa. We need to tackle that poverty. We need the infrastructure to deal with the waste. And our love of plastic has to change, through policy and infrastructure, through awareness and education, and through the changing of our daily myopic habits, both in the UK and Africa.